BWIN Poker, owned by BWIN Interactive Entertainment AG and established in 1999, is one of the most recognizable names in sporting events. Through BWIN Poker, players will be able to win seats to various football and rugby events in addition to land based tournaments across Europe. The poker room is listed on the OnGame Network, supports multi-currency options and provides players with some of the top promotions available online. All new players who signup and deposit at BWIN through our site will receive the highest bonus available in addition to a special player rewards program where you can earn cash back straight into your player account. 100% up to €500 Deposit Bonus - No Bonus Code Needed! Through InternetPoker.com players will receive a $500 bonus on their first deposit when they signup to BWIN Poker through our site. Once you've made your deposit, BWIN.com will credit a bonus account whereby you will need to earn FPP's to release it. The bonus is playable in either the poker room, casino or sportsbook and players do have the ability to stack bonuses if another becomes available before the first deposit bonus is cleared. To clear the first deposit bonus, players will need to earn 8 frequent player points for each dollar in bonus dollars and the bonus must be cleared within 60 days of your initial deposit date. BWIN Poker offers Texas Hold'em, Omaha and even Seven Card Stud. What's great about this they do in fact have a high volume of players which can be attributed to their massive media campaigns throughout Europe and the additional players from the OnGame Network. Hold'em and Omaha are the two most prominent games played at BWIN Poker and players will find plenty of action packed games throughout the room. The stakes range from 0.01/0.02 up to €100/€200 with table limits up to €5/€10 attracting a weaker level of competition than the mid to high stake games. The tournament line-up is just as impressive, with BWIN sponsoring players through satellites and qualifiers for live tournaments and of course awarding packages to various sporting events they sponsor. Players who prefer guaranteed events can find daily tournaments running where prize pools are in the €20,000 - €50,000 range in addition to a weekly €75,000 guarantee. BWIN has always received praise for their software. The software is multi-functional, offering a very sleek design and rich graphics. The BWIN software recently went through an overhaul and new features including a quick seat option. In addition to offering multiple languages and currency options, the BWIN Poker room is compatible for Mac, Windows and Linux users. 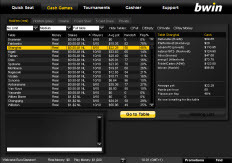 The poker room supports a download client specifically for Windows systems, or players can opt to use the instant play version, which uses a flash application. The instant play features is perfect for Mac players, provides all the same features and slick graphics as the download and loads instantly within the players internet browser. The lobby is easy to use, and provides players with options to make game selection quick and straightforward. Once you've logged into BWIN, you'll be given an option to use the standard lobby which displays all of the games as per normal, or you can take advantage of the quick seat mode. This allows you to set your game preferences by stake, game variation and even the number of seats you'd prefer to play at the table. Other features include; multi-tabling up to 12 games, hand history, preferred seating, in-lobby statistics, and pre-made betting options. BWIN Poker accepts deposits in Pounds and Euros supported by a number of easy to use and safe payment methods. Players will be able to deposit using Visa, MasterCard, MoneyBookers, Diner's Club Card, Pre-Paid Debit Cards or by initiating a bank transfer. If you have any questions, or concerns you can contact BWIN Poker by email, live chat or you can use their toll free number. All three methods are available 24 hours a day and seven days a week. Live chat is generally the fastest method for response, with reps answering within 1 - 2 minutes. Up to €500 free, by signing up to BWIN Poker through our site. Deposit €100 and receive a €100 bonus free. Bonuses are cleared by earning FPP's in cash games or tournaments.